Whether your first aid requirements are business or personal, Fit4Work can deliver first-class training at your premises or at a venue close to you. Our first aid courses will equip your employees with the knowledge, skills and confidence to deal with a first aid crisis. 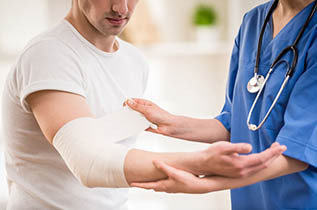 As an employer, you are responsible for providing first aid in the workplace to ensure your employees receive immediate attention if they are injured or unwell at work. Our accredited First Aid at Work course meets the statutory requirements of the Health and Safety (First Aid) Regulations 1981 and provides delegates with the comprehensive practical skills needed to become a first aider. The course is assessed by means of a practical assessment, a multiple choice question paper and a written assessment. Qualsafe Award – Delegates are awarded with an accredited certificate which is valid for 3 years. The HSE recommends that qualified first aiders complete annual refresher courses, particularly in the first two years after qualification. The aim of the First Aid at Work Annual Refresher Course is to enable delegates to refresh their first aid knowledge to ensure they can effectively deal with a range of emergency first aid situations. If you have completed Fit4Work’s First Aid at Work 3 day course, you can receive the Annual Refresher training half price! The course is assessed by means of a practical assessment completed during the course. Qualsafe Award – Delegates will be awarded a certificate of attendance upon completion of the course. This one day accredited course is designed for people who have the responsibility, at work or in a voluntary / community environment, to provide first aid in emergency situations. Delegates will gain the practical knowledge to deal with a range of emergency first aid situations and gain the ability to do this safely and effectively. The course is assessed by means of a practical assessment and a multiple choice question paper. Qualsafe Award – Delegates are awarded with an accredited certificate that is valid for three years.